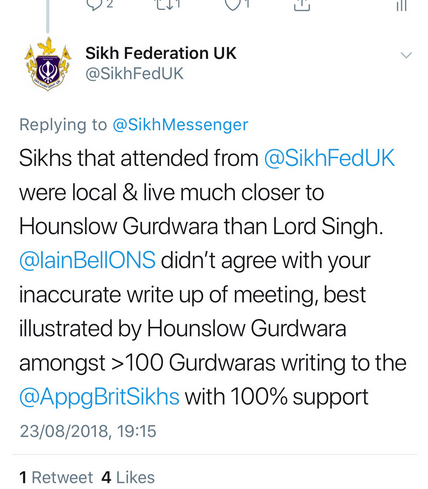 Background: Iain Bell Deputy National Statistician for Population and Public Policy at the Office for National Statistics (ONS) had been invited to the gurdwara over the weekend to discuss concerns felt by the committee over attempts to categorise the Sikh community as an ethnic group. This was as a private meeting to be held with a few members of the committee. An invitation had also been extended to Lord Singh of Wimbledon. As he was not a member of the committee, he first obtained clearance from Iain Bell that it would be OK for him to attend. On the day of the event a number of people from The Sikh Federation (SFUK) turned up uninvited at the gurdwara demanding to be heard. Ian Bell felt he’d already heard the SFUK’s views on a number of occasions, and wanted to hear the views of other parts of the Sikh community. The President of Gurdwara Sri Guru Singh Sabha Hounslow generously allowed in individuals from the SFUK to join the meeting. Iain Bell proceeded in giving a short presentation about the census and its importance. The meeting was then opened for general discussion. In an abuse of hospitality, the SFUK began recording proceedings and taking over the meeting, stating Sikhs were an ethnic group and must be monitored as such. 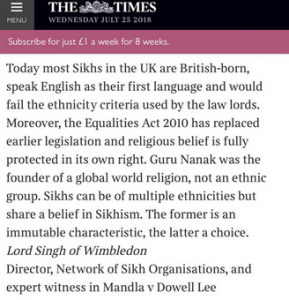 Lord Singh of Wimbledon explained that the House of Lords in 1983 had allowed for Sikhs to be counted as an ethnic group solely for protection under the 1976 Race Relations Act. This this was done because there was then no protection against religious discrimination, but the situation today was different because all religions are protected by legislation. He explained that Sikhism was a world religion, which should not be confined to those of Punjabi ethnicity. 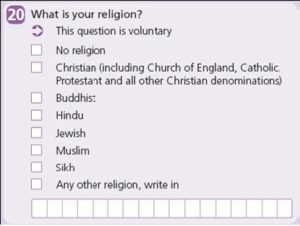 Iain Bell confirmed that there was no substantial under-recording of Sikhs in the response to the question on religion. In response to a question on the possible misuse of data, he also confirmed that that there were rigid checks in place to prevent this. Lord Singh, emphasised that all Sikh organisations should use their influence to get the fullest possible response to the religious question. He reminded the meeting that at the time of the 2011 census some Sikhs had ill advisedly campaigned against identifying Sikhism by Sikhs as a religion. 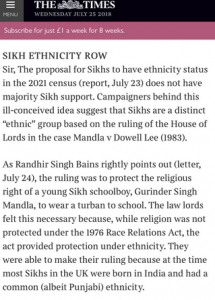 Another argued that ethnic monitoring was necessary to protect Sikhs against discrimination, but failed to explain where such discrimination was taking place. Another argued that the Sikhs should be given a favoured status because of the contribution Sikhs had made to Britain over the years. Ethnicity is linked to genetic makeup and that trying to tie religion to ethnicity leads to absurdities. A Committee member asked the SFUK, does a person’s ethnicity embody DNA change if he or she converts to Sikhism? This was met with silence from the SFUK representatives. The Sikh Gurus have always taught against dividing people into different groups and races, emphasising we are all members of the same one human race. Guru Nanak travelled the length and breadth of India and to different countries to emphasize the universality of Sikh teachings. People from any part of the world can become Sikhs. No evidence had been produced to show that Sikhs would gain in any material way by being classified as an ethnic group, but even if there were, it would be wrong to try and gain material benefits by compromising Sikh teachings. 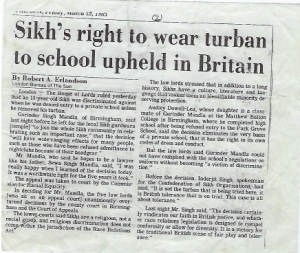 Lord Singh reminded the meeting that the Mandla case in the early eighties was fought to protect the rights of a Sikh schoolboy to wear Sikh religious symbols. He explained that ethnic monitoring could prevent such protection. He gave the example of a large organisation like the BBC being shown to have the right number of ethnic Sikhs, masking possible discrimination against those that wear Sikh symbols. Lord Singh said there was considerable discrimination against Sikhs in the provision of services by the government and various government bodies. Communities like Jews and Muslims were being given additional resources, not as a result of ethnic monitoring, but because of effective lobbying, (neither community is categorised as an ethnic group by the census). Today, hate crimes against Sikhs are still being recorded under the ‘Islamophobic hate crime’ category by forces like the MET and other agencies. Ethnic monitoring cannot help remove this blatant discrimination. 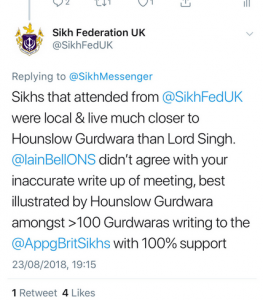 In response to calls from SFUK members to arrange more meetings, Iain Bell said that he would like to reflect on what he’d heard, and if whether or not an effective case had been made for a Sikh ethnic tick box or not. Members of the gurdwara committee made clear they saw no sense and only confusion in a separate Sikh ethnic tick box. 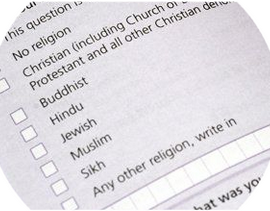 Bell confirmed the ONS had received legal threats from certain sections of the Sikh community if the ‘ethnic Sikh tick box’ wasn’t included in the 2021 census. The meeting concluded with the President Gurmit Singh Hanzara and all present thanking Iain Bell of the ONS for coming to Hounslow from South Wales on a Saturday, and wishing him by a comfortable journey back home.